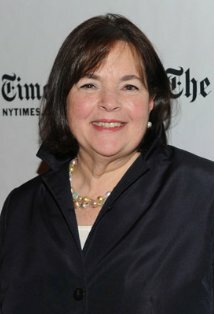 See the gallery for quotes by Ina Garten. You can to use those 8 images of quotes as a desktop wallpapers. I always have music. I love it to be very upbeat. When you're having drinks, I like something like Cesaria Evora. During dinner, I like the much more traditional - old Frank Sinatra and things like that. 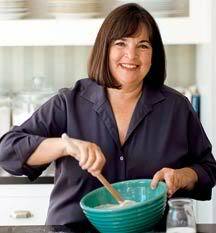 I measure everything, because I always think that if I've spent so much time making sure this recipe was exactly the way I want it, why would I want to throw things into a pot? I worked for the Office of Management and Budget in the White House, on nuclear energy policy. 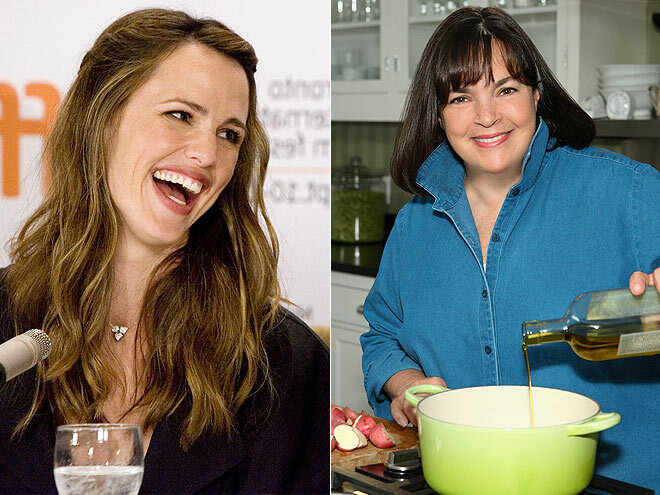 But I decided it would be much more fun to have a specialty food store, so I left Washington D.C. and moved to the Hamptons. And how glad I am that I did! I'm really a scientist. I follow recipes exactly - until I decide not to. And then I'll follow something else exactly. I may decide I could turn this peach tart into a plum tart, but if I'm following a recipe, I follow it exactly. If it's a cocktail party, I generally make five or six different things, and I try to choose recipes that feel like a meal: a chicken thing, a fish or shrimp thing, maybe two vegetable things, and I think it's fun to end the cocktail party with a sweet thing. My favorite fall or winter lunch is big steaming bowls of soup. I usually invite people for around 12:30 and have two hearty soups like shrimp corn chowder and lentil sausage soup, which can be made a day or two ahead. Take one flower that you like and get lots of them. And don't try to 'arrange' them. It's surprisingly hard to do a flower arrangement the way a florist does one. Instead, bunch them all together or put them in a series of small vases all down the table. The dirty little secret is that I grew up in a household where there were no carbohydrates allowed, ever. No cookies, no bread, no potatoes, no rice. My mother was very extreme in terms of what she served. Since I left home more than 40 years ago, I've been making it right for myself. The most important thing for having a party is that the hostess is having fun. I'm very organized. I make a plan for absolutely everything. I never have anything that has to be cooked while the guests are there. The only thing I might have to do is take something out of the oven and carve it. The thing about all my food is that everything is a remembered flavor. Maybe it's something I had as a child or maybe it's something I had in Milan, but I want it to taste better than you ever thought. There's something really wonderful about a party where you help yourself. Of course, first you get what you really want. But 'family style' service also really encourages people to connect with one another. If you think about a Thanksgiving dinner, it's really like making a large chicken. I love to take something ordinary and make it really special. You don't have to do everything from scratch. Nobody wants to make puff pastry! Instead of going out to dinner, buy good food. Cooking at home shows such affection. In a bad economy, it's more important to make yourself feel good. They say that gardens look better when they are created by loving gardeners rather than by landscapers, because the garden is more tended to and cared for. The same thing goes for cooking. I only cook for people I love. I always like to have flowers on the table. I think they make it look special. Never let 'em see you sweat. Guests feel guilty if they think you've worked too hard to make dinner for them - which of course you have! Grilled cheese and tomato soup is the ultimate comfort meal. I absolutely adore Thanksgiving. It's the only holiday I insist on making myself. I don't like sitting at a table that's too large, where everyone is too far apart. That's a party killer. I like almonds as a snack - keeps your energy up but doesn't fill you up. I time everything. I'm a scientist at heart. I use other cookbooks for inspiration. I must say I tend to cook from my own cookbooks for parties. 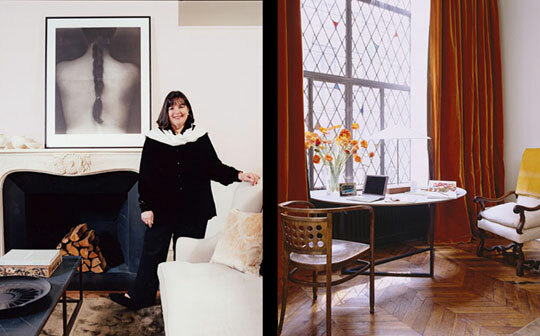 Much more quotes by Ina Garten below the page. 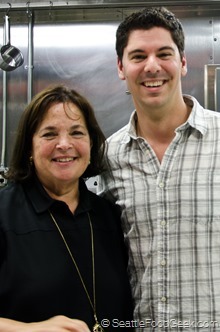 I've lived in the Hamptons since 1978, when I first bought my store Barefoot Contessa. I've taught myself how to use good, fresh ingredients and to prepare them as simply as possible by cooking only to enhance their intrinsic flavors. My extravagance is my garden - it's the first thing I look at every morning when I wake up. It gives me so much pleasure. People have more fun if they don't eat so much they have to be taken home in an ambulance. The most overrated tool: a pasta maker. Why make it when you can buy it? It's a lot of work! 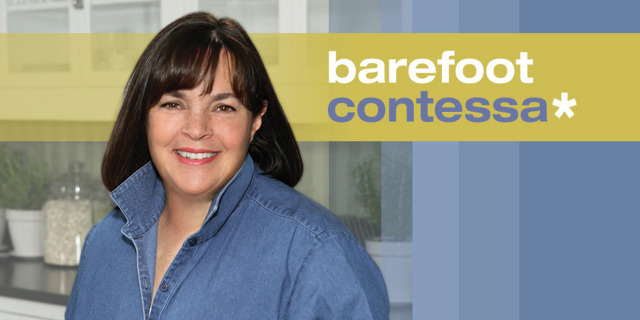 When I wrote 'Barefoot in Paris,' I wanted to make simple recipes that you could make at home that tasted like French classics. I learned that the hardest party to pull off successfully is Saturday night dinner. This meal is expected to be elaborate: appetizers, first course, dinner, dessert, and coffee. People arrive at 7:30 or 8 p.m. and stay for hours - definitely past my bedtime - and they all go home exhausted. I try to greet my friends with a drink in my hand, a warm smile on my face, and great music in the background, because that's what gets a dinner party off to a fun start. In the summer you want fresh, light and sort of quick things; in winter you want things that are comforting, so your body really tells you you want to go towards potatoes, apples, fennel, things that are warm and comforting. And loin of pork. My mother would never let me in the kitchen. I always wanted to cook, but I was never allowed to. 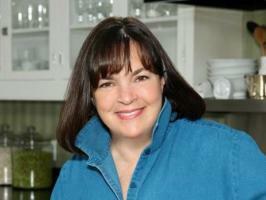 Her view of the world was, 'Cooking is my job, and studying is your job.' I think, in retrospect, she didn't like the chaos. She was very orderly. It had to be her way.